MUSIC JOBS - Yes, they DO exist! According to the US Bureau of Labor Statistics, music jobs - even the live performance area - have been expanding and will continue to do so. So, we can all exhale, finally. I think it's quite likely that all the music ed advocacy which has gone on over the past few years has had an effect! 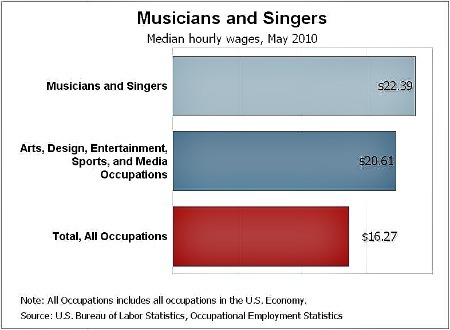 "The median hourly wage of musicians and singers was $22.39 in May 2010. The median wage is the wage at which half the workers in an occupation earned more than that amount and half earned less. The lowest 10 percent earned less than $8.50, and the top 10 percent earned more than $60.02. Religious, grantmaking, civic, professional, and similar organizations ---- $14.95"
Note that “performing arts companies” has the highest reported median wage. Which offers intriguing possibilities. Does your locality have a little theatre co.? a dinner theatre? etc.. This could be your ticket. And may offer many more opportunities to make inspiring music and have a rewarding career than chasing the fantasy of being a rock star who dies of an overdose at age 27. So, the music jobs are there, and musicians can and do earn a good living. "Employment of musicians and singers is expected to grow by 10 percent from 2010 to 2020, about as fast as the average for all occupations. Expected growth will be due to increases in demand for musical performances. "The number of people attending musical performances, such as orchestra, opera, and rock concerts, is expected to increase from 2010 to 2020. As a result, more musicians and singers will be needed to play at these performances. "There will be additional demand for musicians to serve as session musicians and backup artists for recordings and to go on tour. Singers will be needed to sing backup and to make recordings for commercials, films, and television. [...]"
"Despite expected growth, there should be strong competition for jobs because of the large number of workers who are interested in becoming musicians and singers. In particular, there will likely be considerable competition for full-time positions. "Musicians and singers with exceptional musical talent should have the best opportunities." So, "How do you get to Carnegie Hall?" That is what this site is all about. Seriously and practically, in my own research and experience in the development of musical "talent", "skill", "genius", what-have-you, the one thing I have determined is that there IS no "one thing" that will turn a tone-deaf klutz into a budding Mozart. However, there are quite a few systems, regimens, and methodologies around which can shave months or even years off one's quest for the goal of musical excellence. And that's also what this site is all about. The Music Education Blog News and vital info on music education and resources for all teachers, students and players of music. A CREATIVITY QUOTE [OR TWO, or three] TO INSPIRE YOU to GET THOSE MUSIC JOBS! The right creativity quote CAN open up doors for you. Here are some really good ones! MUSIC AND INTELLIGENCE - The Power of Music How related are MUSIC and INTELLIGENCE? Derek Paravicini, Rex Lewis-Clack, and Matt Giordano show us the answer. 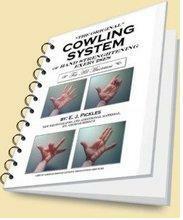 HAND STRENGTHENING EXERCISES FOR MUSICIANS - "The Original" Cowling System© Hand strengthening exercises FOR MUSICIANS ONLY - "THE ORIGINAL" COWLING SYSTEM. Play CLEANER, FASTER & BETTER, right now! MUSIC TEACHING SOFTWARE This is the BEST MUSIC TEACHING SOFTWARE I've seen! And check here for some great tips on how to practice music. SLOW DOWN MUSIC SLOW DOWN MUSIC - WITHOUT changing its pitch! Here are the current front-runners in "slow-down" audio and video software. MUSIC READING TIPS Reading music doesn't have to be mysterious or tedious. Get help with these free music reading tips and links to great resources!